THE DYNAMICS OF STANDING STILL is a fascinating and very convincing introduction to Zhan Zhuang Chi Kung. 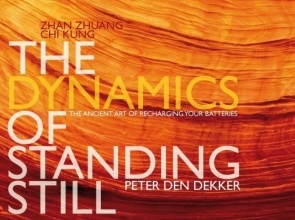 Beautifully illustrated and easy to understand, this book explains why standing still is at the core of Chi Kung and various Chinese martial arts. Between wanting to do and not yet doing, between ‘Get Set!’ and ‘Go!’, there is a no man’s land with a high energetic charge. This capacitated potential is the focal point of Zhan Zhuang Chi Kung, the ancient art of charging your batteries. Peter den Dekker teaches Chi Kung in various European countries as a senior student of Chi Kung Master Lam Kam-Chuen. He leads special trainings for people with immunity weakness and is a sought after guest teacher at academies and congresses.